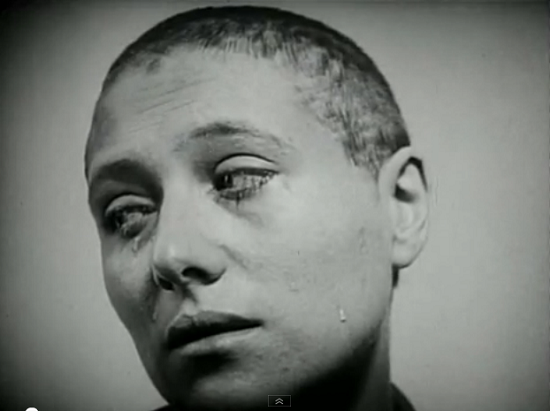 Carl Dreyer's great film, “The Passion of Joan of Arc”, is one of the undisputed classics of silent cinema- a film which has been called an "exploration of the human face" in documentary fashion. “The Passion of Joan of Arc” follows the youthful Joan (Renée Falconetti) through her final days on earth, as she is judged by the English in a kangaroo court where the only certain verdict is death at the stake. Falconetti's dazzling performance in this film conveys the simple faith, deep compassion, and surprising inner strength of the young woman. 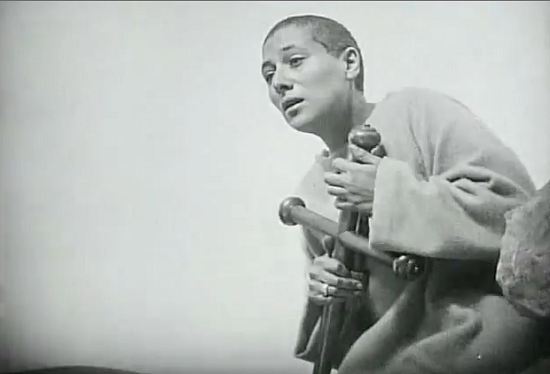 It is virtually impossible today, even on a first viewing, to come to “The Passion of Joan of Arc” with a wholly fresh eye, so familiar have stills from it become. This may partly explain why some critics have tended to dismiss the film as no more than “an extension of still photography. ” Dreyer tells the story of Joan through an unending series of densely interwoven close-ups of faces, thus largely eliminating the effects of staginess and finiteness which as a rule are inseparable from historical films. Certainly few films, before or since, can have contained such a high proportion of facial close-ups—dictated, according to Dreyer, by the inherent nature of the material. “There were the questions; there were the answers—very short, very crisp.... Each question, each answer, quite naturally called for a close-up....In addition, the result of the close-ups was that the spectator was as shocked as Joan was, receiving the questions, tortured by them,” There was also a notable lack of establishing situation-shots: deprived of any clear sense of geographical layout of the various settings, we are left as helplessly disoriented as Joan herself. The film is based on the real story of the trial of Joan of Arc. Born an illiterate farm girl in the year 1412, she became France's 15th century mystic-warrior "Maid of Orleans." In the midst of the Hundred Years War between England and France, Joan was told by "voices of light" that she had been given a divine mission to reunite France. Believing she was on a mission from God, the 17-year-old rallied French troops to important victories before being captured by the English and turned over to an ecclesiastical court composed of French clerics who supported the English. Although she was a devout Catholic, Joan of Arc chose to honor her personal relationship with God over her duty to organized religion. In 1431, the Catholic Church put her on trial for heresy, excommunicated her and then had her burned at the stake. By 1452, there were serious questions about Joan of Arc's conviction. The Catholic Church conducted a new investigation, and in 1456, she was found innocent and the tables were turned on her persecutor. The late Pierre Cauchon, the man who led the charge for her conviction, was instead found guilty of heresy. Some 100 years later, Martin Luther would pick up this thread and ignite the Protestant movement. By the late 1600s, Joan of Arc would become a symbol for the Catholic League, her name would be invoked in France as a political statement during the time of Napoleon Bonaparte, and she later would be seen as a shining example of the power of women during the early years of the suffrage movement in the United States. In 1920, nearly 500 years after her death, Joan was declared a Catholic saint, the only saint who was first excommunicated and burned. 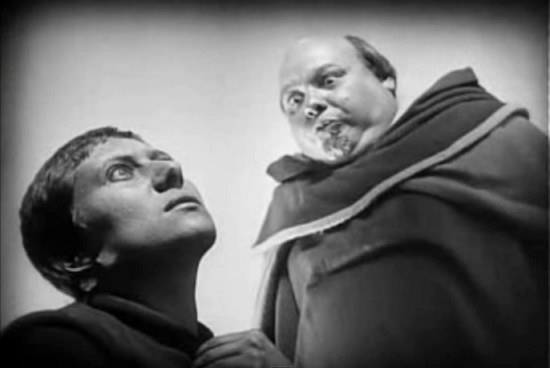 Along with the rest of the cast, Falconetti acted completely without make-up; Rudolph Maté’s high-contrast lighting brought out every detail of the actors’ features with stark clarity. Antonin Artaud was at his most gauntly beautiful as the sympathetic Massieu, while the faces of Joan’s accusers, all lumps and warts and fleshly pouches, frequently recall the onlookers in crucifixions by Breughel or Bosch. These hostile figures are repeatedly shot from ground-level, to make them appear huge and intimidating. The visual and pictorial style of filming was perhaps the most distinctive achievement of Dreyer.Filmed in 1927 and released in 1928, "The Passion's" stark elegance and innovative use of camera angles and close-ups reverberated through the artistic community. Legendary director and actor Orson Welles once said he based the camera techniques of "Citizen Kane" on "The Passion." Today, this film is considered as one of the most enduring works of art of the silent era.